After testing all the "Take n Bake" pizza's in the bay area, we found Murphys was the best. These pizza's are on paper trays. Preheat the oven to 425 and proceed to make pizzas by adding topping people ask for. Its easy to sell a whole pizza to a group of 4 or 5 for $12. You can get creative here by adding toppings that are in the galley. Be creative in asking and trying different ways of topping. Cook the pizza 5-8 minutes or until the crust is a little firm and well cooked enough to remove it from the plastic/paper tray easily. Then place it on an inverted oven tray and finish cooking it for another 8-10 minutes or until it looks ready. Some ingredients like green onions should be added after cooking when the pizza is still warm though. Murphys doesn't often advertise Pizza's at $5. However, they do have them if you ask. 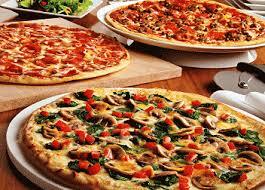 They are thin crust with either cheese, cheese with pepperoni or with sausage. We found the plain cheese ones were the best. Pre-sliced mushrooms work well with this recipe. They absorb the flavors regardless it pepperoni or vegetarian.